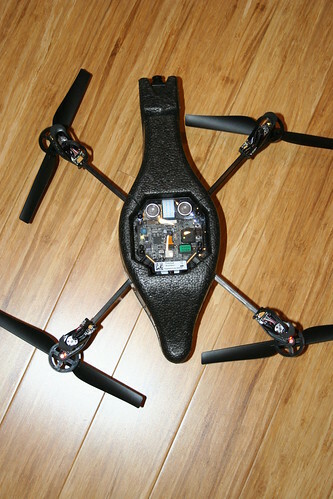 Super excited...the Parrot team sent me two AR.Drones as development kits! (One is for me and the other for a famous game designer friend). They just arrived, and here are some first impressions and closeups. 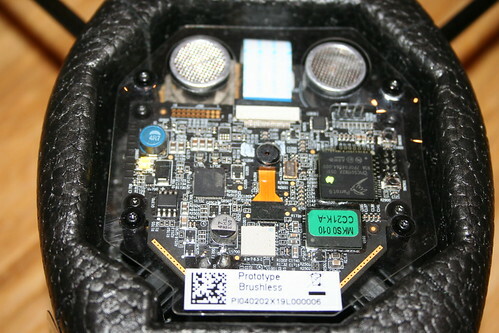 This is the main board, with the Arm9 core in custom Parrot DSP silicon, the downward-facing camera for optical flow, the ultrasonic sensor and the WiFi radio. 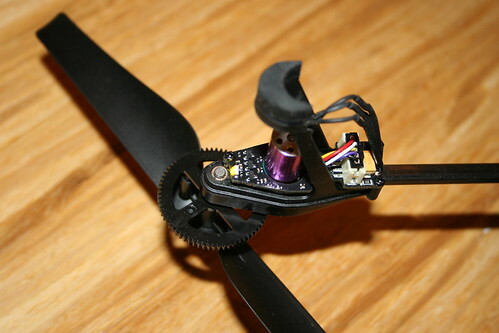 This is a closeup of one of the brushless motors and ESC (the quad comes in either brushed or brushless models). 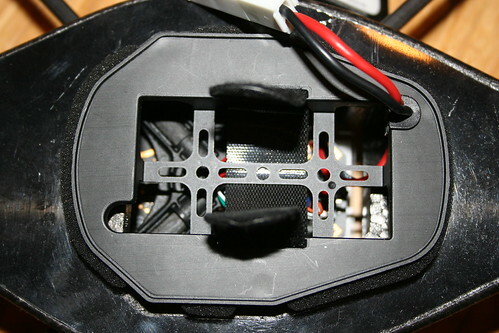 This ESC runs at 200Hz. It comes with a 1000mAh LiPo and charger. I want one of these badly :-) I wonder if they would give me one if I promised to fly it (and film it) off the top of Burj Dubai when I go there next month. Chris, hit me up if you want. I can build the App for you and get you a bundle you can just install through iTunes. 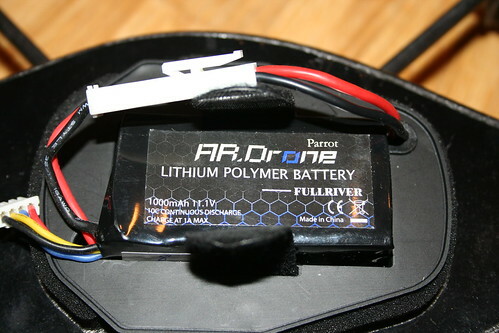 I snagged the code from Parrot yesterday and have been messing with it (mostly to see if I can adapt for the AeroQuad project). They have flight code available for d/l, or just game API? 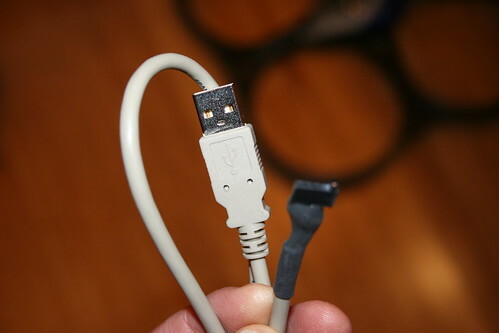 Its just the iPhone side. Control API and Game API (really. That's their marketing plan? Strange). They do list in the developer docs the API used to send control commands to the quad, but the examples come with a static library for that (at least for the iPhone examples). All the main flight control code appears to be closed source and not available. It's probably over $500 for the brushless version. How did the French get 802.11 in there? The cheapest 802.11 module from $parkfun is a $70 brick. If only someone with teardown skills ended up with it, but the free samples would have to cost a lot more for that to happen. SyChip makes an 802.11b/g module for $29, and I'm pretty sure there are even cheaper units out there.